Most of my readers should know by now that I'm training for an Ironman (and two half Ironmans). Is that the right pluralization? I want to say Ironmen. But those are men... made of iron. I guess. But iron is heavy. It would be hard for ironmen to complete Ironmans. That's it! That's the end of the post! Close the browser, drink wine, frolic merrily, make love. Oh, that's only 67 words. What else can I talk about? Right! 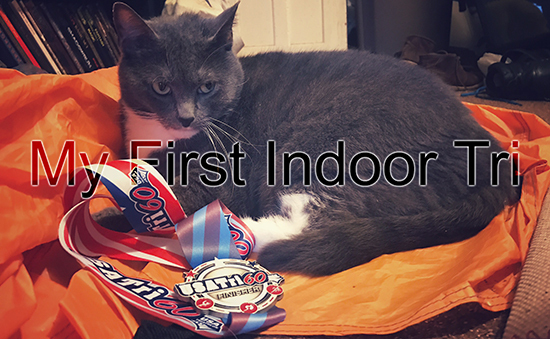 I did my first indoor tri this morning! I did the Tri60 at the Y today. It's an official USAT triathlon, with rules and stuff. One of those rules may or not be that you can't take your shirt off. Meghan got thoroughly incensed when I asked if I could take my shirt off for the run. And I don't mean she was fragrantly perfumed (but I mean, she may have been). Something about how women can't take their shirts off (though I wouldn't be one to complain). So I sweated. The Tri60 was a 10 minute swim, a 10 minute transition, a 30 minute bike ride, a 5 minute transition, and a 20 minute run. All indoors. It turned out to be crazy fun. I did it with Geoffrey, Meghan, and Meghan's daughter. None of us knew exactly what to expect. But we pushed hard and had an epic time! A few minutes before the first wave! The kids wave was first. We watched and cheered them on. Meghan's daughter is a turbo swimmer. She was a blur of movement. I quickly lost count of her laps. Then they went upstairs for the bike portion and we got in the pool. There were six of us total in the 2nd wave, including me, Geoffrey, and Meghan. I split a lane with the only person there who swam slower than me, which helped boost my fragile ego. But she was nice and didn't splash me. I swam 19 lengths in 10 minutes, or 475 yards. That's not super impressive as far as swims go, but it was by far my fastest swim, so I was quite happy. Geoffrey and Meghan swam farther, but they're made of pure muscle and train brutally. I could see Geoffrey in my peripheral vision flying back and forth, that is when my lane-mate wasn't blocking my vision with her backstrokes. We dried off in the locker room and I changed. I would've high-fived Geoffrey, but that's awkward to do when you're naked. I would've high-fived Meghan, but it would've been super awkward if she'd been in the men's locker room. We headed up to the spin room with time to spare. We had arrived earlier that morning and Geoffrey had helped me pick the settings I would need for the bike. So I set up the bike, hopped on, and started to warm up. How do I describe the bike portion.... It was ridiculous. I was ridiculous. I'm used to riding a stationary in front of a TV. So without anything to engage me, I filled the room with absurd chatter. Keep in mind there were six of us biking in there, half of them strangers to me. And then two volunteers: One I believe was a spin instructor, and the other a guy with a clipboard. I remarked about the "scenery" on our ride. "There's the Eiffel Tower! Watch out for that truck coming up behind us." 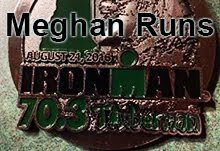 Meghan and I teased Geoffrey on his long transition times at triathlons. I joked about passing each other, and about Meghan falling off her bike (which was quite stable). I mentioned how I was sweating so much that our next transition would be a swim. The spin instructor couldn't contain her laughter. Meghan mentioned afterwards how "distracting" I was. I think I may have cost her a couple tenths of a mile on her ride (insert laugh out loud emoticon here). It was my devious ploy all along! Our half hour rides were all within a mile of each other. We stumbled off our bikes with jellied legs and headed to the treadmills. I was completely soaked at this point (again). The volunteers all gave shrugs about my shirt-removal query, but Meghan was so vehement with her argument that I decided to suffer for the sake of fairness. She was right though: It would've been an unfair advantage. And other USAT tris don't let you do it. It was hot in that gym! But the run was my event. The others may smoke me on the swim and bike, but I can still run like there are coyotes nipping at my ankles. My goal was to run a 5k in 20 minutes. But it was just too darn hot and my scalp was tingling with that "you're about to pass out" sensation for the entirety of it. I managed 2.96 miles - with Geoffrey cheering me on from the next treadmill over - for a 6:45 pace. Not too shabby! The three of us placed in the top three overall, although it was based on the total distance, not any sort of weighted average. So the swim, my weakest event, didn't count much against me. It didn't matter anyway, because there weren't place medals. We all got awesome finisher medals! None of us really cared that much anyway. It was such a fun time! And we all went as hard as we could. That was the coolest part of the Tri60. It was short enough that you could go nearly all out on every segment. And there weren't any hills, or wind, or choppy water, or sharks, or errant tree roots to throw you off. It was all you, pushing at maximum effort. And even though everyone performed at their own paces, we were all together for the whole of it. That's rare! 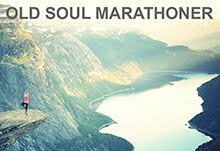 It was a fantastic event, and I absolutely recommend it to everyone who's interested in triathlons. Any skill level can participate. It's great for training, to measure your current abilities, or just for fun! The volunteers were awesome, and the Y was awesome for hosting. I believe every YMCA does the same thing. There's no reason not to do it! I am super excited for the rest of the tri season! This event sounds very cool. In need to look into one of these. I am open to competing in some sort of triathlon, but I need to sharpen up my swimming, especially for the open water. Thanks again for sharing, seems like y'all had an amazing time!